Installing a new bathroom is a job for the professionals as a gradient needs to be created along the floor to channel the shower water into a drain and then the entire room needs to be waterproofed to the highest standard. Thats where we come in. The most common method for creating a gradient is to install a sub-floor made fibro compressed sheets or concrete slab, which is then tiled over. Another option is to install a ready-made sloping shower former (a bit like a giant shower tray), which is also then tiled over. A final method is to use a giant preformed tray that slopes towards a drain, and can be fitted across the entire floor without the need for tiling over. Waterproofing involves treating the floor, the lower section of the walls and all the joints, nail holes, taps, roses and pipes of the walls area around the shower, applying floor waists and water stops to the shower and door and then covering with a AS Standard wet area membrane. Once it’s set, the room is then bedded and then tiled. A bathroom is super-stylish and perfect for creating a contemporary look. 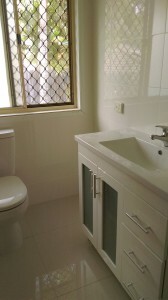 As a second bathroom can easily increase the value of your Brisbane home. Bathrooms are, in general, easier to clean. Tiles are the most popular wall and floor covering, but you can opt for sheet vinyl for the floor, or even Corian, which is a seamless, non-porous material that is low-maintenance. If you are going to use tiles, choose non-porous tiles like ceramic or porcelain. Porous tiles, such as slate, marble and limestone need sealing every few months to prevent water damage. Only use floor tiles specifically for bathrooms and wet rooms on the floor as they aren’t slippery. We provide and apply waterproofing membrane to shower bases, shower/baths and floors as well as installation of shower hobs, water stops and floor wastes.